Collecting enrollment fees for hundreds of campers can be frustrating when you’re already responsible for organizing a summer camp. With payment processing apps such as PayPal, Stripe, and Square, JotForm gives you the option to easily collect payments through online forms. After collecting your payments online, you can automatically save all transactions as PDFs using JotForm’s Summer Camp Invoice PDF Template. 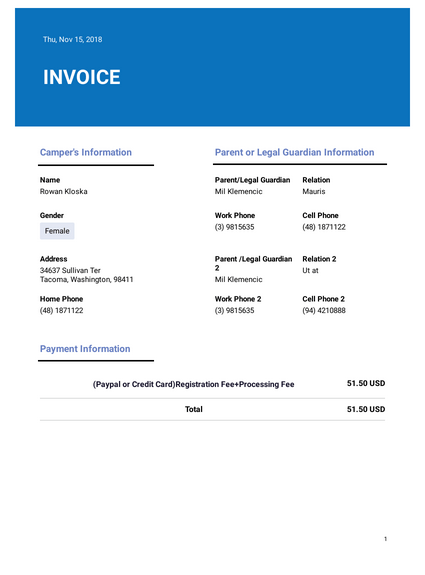 This summer camp invoice template is fully customizable. With JotForm’s PDF Editor, you can create additional form fields to include as many payment details as needed. Once the receipts are saved as secure PDFs that can easily be downloaded, printed, and shared with your campers’ guardians, you can make sure the proper payments have been made and finally have some peace of mind before summer starts. To protect campers’ health and safety, this Camper Health History PDF Template collects information about existing medical conditions, allergies, dietary restrictions, immunizations, medication instructions, and emergency contact numbers.